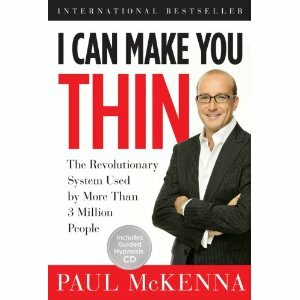 Several years ago, I saw Paul McKenna on an episode of Oprah and listened to him claim that with his system, one could eat whatever they wanted to and still lose weight. Naturally, I found this so ridiculous that I just had to stop and hear more about what he was saying. Apparently, I am not prepared to dismiss wild claims made by marketers out of hand (advertisers love me.) Even with the ridiculous claim, my interest was piqued and I bought the book. Four years later, I’ve finally gotten around to reading it. McKenna’s system focuses on his 4 golden rules, 2 of which I disagree with in regards to diet (which he defines as: any system of eating that attempts to exert external control over what, where, when, or how much you eat.) and I won’t give the book away by revealing those rules either but I do recommend it for other important reasons. Paul McKenna is a licensed hypnotherapist (which he downplays in the book) and he demonstrates how, by properly applying the principles in the book, we can “rewrite” the negative programs that are constantly being run in our subconscious mind, keeping us from achieving all that we are capable of. Regardless of your opinion about hypnosis in general, there is a mountain of compelling research that proves its legitimacy. I for one, find hypnosis very effective. For those who believe, hypnosis can be used as a powerful tool to be utilized in weight control, self-improvement, and many other areas in life. McKenna goes so far as say that almost all problems, including weight control, stem from the same cause: negative programming continually running in the subconscious mind. In I Can Make You Thin, he shows us how to implement his system and how, using hypnosis, you can begin using the mind as an ally in weight control or any other challenge. The book comes with a hypnosis CD that gives your subconscious mind “suggestions” that will help you change the way you think about food and feel better about yourself. Get more information about I Can Make You Thin and other great resources on my Recommended Reading page at www.Jinifit.com.